Social media was shown to be quite effective in getting people to the polls, says a recent study. With nearly 1 billion users, Facebook has clearly become a feature of many people’s lives worldwide. A new study suggests that the social network has the potential to get hundreds of thousands of people to engage in a single behavior – namely, voting. Researchers report in the journal Nature that one Facebook message may have gotten 340,000 additional people to the polls for the 2010 United States Congressional elections. The team, led by James Fowler, professor at the University of California, San Diego, designed the experiment with the cooperation of Facebook. Cameron Marlow of the data science division of Facebook collaborated on the study, too. “This really, I think, is the first study to show that online social networks can affect these real-world behaviors at a scale that’s potentially important,” Fowler said at a news briefing Tuesday. Fowler and Harvard’s Nicholas Christakis are prominent in social network research; their book “Connected” gathers copious research on how a myriad of behaviors spread from person to person. For instance, you may be happy as a result of your friend’s happiness and your friend’s friend’s happiness. Bad habits such as smoking can also spread in this way. “The network is key,” Fowler said. “If we want to make the world a better place on a massive scale, we should focus not just on changing a person’s behavior, but also on utilizing the network to influence that person’s friends,” he said. There were two other groups: about 600,000 people saw all of the above with out the pictures of Facebook friends, and an additional 600,000-some didn’t receive the message in their News Feeds at all. All participants were randomly assigned. People who got messages were more likely to vote than those who did not, the researchers found – in fact, the percentage difference between the groups in the experiment suggests that an additional 60,000 people were motivated to vote as a result of the message. 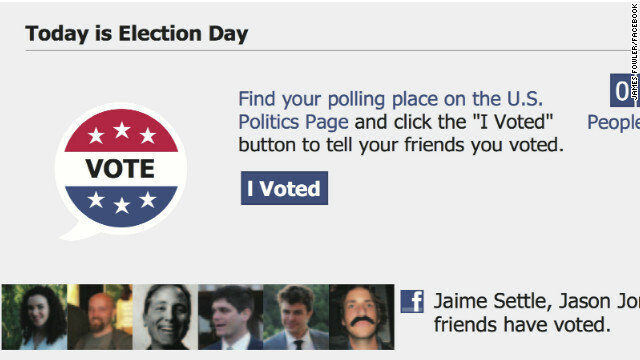 Seeing the photos of Facebook friends as part of the message appears to be critical in getting people to vote, the researchers found. Users who got the message without photos were no more likely to vote than people who didn’t get any message. But those who got the message with pictures had higher voting rates. “The messages not only influenced the users who received them, but the user’s friends, and their friends of friends as well,” Fowler said. Moreover, the friends of the people who saw the messages were also more likely to vote than friends of participants who didn’t see the messages, Fowler said. Multiplying this effect per friend by the number of friends by the number of people who saw the message, researchers determined that 280,000 additional votes were cast. All of these resulted from ties in the social network, not the message itself, Fowler said. Close friends – with whom Facebook users likely have a face-to-face relationship – were extremely influential in this contagion of voting, the researchers found. How do we know that these 340,000 people wouldn’t have voted anyway? Fowler compares this to a drug trial, in which some people get randomly assigned a medical treatment or a sugar pill. If the people in the treatment group tend to show more positive effects than the control group, that means the drug may cause a positive effect. Researchers didn’t just rely on the self-reported information on Facebook about who voted, they also used publicly available voting records. It appears that 4% of people who said they voted on Facebook did not actually vote. The effect of the message appears to be nonpartisan: As many Democrats as Republicans seem to have gone to the polls as a result of the message, Fowler said, although many people do not state their affiliations on their Facebook profiles. There are still unanswered questions about the implications of this research, however. It’s not clear whether age is a factor in who voted. Researchers have yet to explore other characteristics of people who are most influenced by Facebook messages. All in all, between the direct and indirect effects found in the study, the total percentage increase per person in voting behavior as a result of a Facebook News Feed message is about 2.2%. That’s on the lower end of the spectrum compared to what other “get out the vote” studies have found with regards to other means of communication. But the real effect could be even greater than what the study observed, Fowler said. A lot of people who saw the message had probably already voted, through early voting and absentee ballots – in fact, one-third of voters in the 2010 election cast their votes before Election Day. Many people who saw the message were also unable to vote because they logged into Facebook too late in the day to go to their local polling station - as high as 20% may have been in this situation, Fowler said. Also, younger people are less likely to vote, and are less susceptible to such appeals, he said. “I think if you added all of these things up, we’d find that this was actually one of the stronger ‘get out the vote’ messages that we’ve seen in the literature,” he said. Sadly, it will bring the lazy liberal idiots out of the woodwork. the more people that vote... the more people are represented. If you think that more voting would create an unwanted result.. then the majority is not being represented. You are admitting that you are on the loosing team. Republican's have really dine a number brainwashing folks into thinking that obstructing a vote helps the results. It's a shame that there are so many such folks breathing air. desperate times , call for desperate democrats to desperate measures. Face Book is a big SCAM on the American people and people of the world. It is just making a few millionaires and collecting information on the users. Soon. FB will have cameras installed in all retail and grocery stores, watching you shop. They will be gathering information on what you look at and what you purchase. Yes, FB is a SPY on the users. Any smart user would cancel their pages on FB. People FB is a SCAM. Woh... Cody, calm down. I was referring to Mark with a sarcastic comment because of his paranoia. We are giving permission for big brother to watch us. To the Families of our beloved servants for the United States,you all have our deepest regrets and sorrow at this time. May God give you all the courage and strength.We thank them for their unconditional love and time they shown for our country..We thank the families for allowing the time and support and service their love one gave.. It is never easy to lose a love one for any reason at any time. During such terrible times around the country and as we all mourn with the family of our Great HEROS..I have nothing but disgrace for the GOP's nominees for President Mitt Romney to such a prestigious and serious office was so uncaring and out touch with the terrible tragedy and death of our fellow Americans. Mitt Romney is truly a joke and do not express the majority views of Americans. We understand grief and mourning of love ones. Maybe he need to just step down from political arena. He is not ready for this stage as America's leader.. He is not what we precede a President to do at a time like this. President Obama and Ms Clinton followed the right protocol. They are very caring and confronting in their deliverance of the tragic news. Mitt Romney got HOME and feed your horses and watch your car elevator go up and down. Please everyone vote for PRESIDENT OBAMA AND ALL DEMOCRATS IN THEIR RACES ON NOVEMBER 6, 2012. Users who received the message without photos of their friends voted at the same rates as those who saw no message at all. Those who saw the photos of friends in the message were more likely to vote. Even self-descriptions as liberal or conservative made no difference. Simply put, friends’ photos made all the difference. For attracting votes, customers or cause backers, Fowler’s experiment demonstrates how swiftly and certainly we can scale action through the involvement of “just” two degrees of separation. Imagine if either presidential campaign chose to reach out, via Facebook to those who have already declared themselves avid backers, and used the algorithm (or created their own) While the message-per-friend amplification is small, scaling is huge. Multiply a small effect across millions of users and billions of online social network friendships you can reach huge numbers of people. Excellent insights Elizabeth in this column. I, too, offered a slant on the study results today:As many social science studies show, we look for ideas that reinforce our bias and usually hang out with people who share our values and views. When we don’t have a strong view on something, we turn to people we trust to help us decide. Those notions are supported by the results, announced today, of a massive social experiment that will have far reaching affects. The study showed that about one third of a million more Americans voted in 2010 because of one Facebook message on Election Day.